Sewage, garbage collection and paved roads are, for obvious reasons, vital, and can be provided only from outside. But even more important, in the well-informed view of slum-dwellers, are buses: affordable and regular bus service into the neighbourhood is often the key difference between a thriving enclave and a destitute ghetto. Microtransit: good or bad for cities? Or bicycles and safe, direct cycling paths. Very much cheaper than buses and they don’t pollute with exhaust that kills. Interesting to note in many Third World countries, private jitney’s are used and are profitable and don’t need government subsidies. I would have to guess, the government’s priorities are getting its own residents around and not slum-dwellers and foreign workers unfortunate to say. Then again, in America, there’s growing reallocation of resources from buses to poor neighborhoods to streetcars and express buses to middle-upper class neighborhoods. Bicycles break down, get stolen, and can be expensive to purchase. It’s great to provide for them, but buses need to be there too. Buses break down, get stolen, and are expensive to purchase. It’s great to provide for them, but bikes need to be there too. Bicycle infrastructure is good, but doesn’t negate the need for good public transport. It’s unhelpful to pit the two against each other. It also seems patronising to tell poor inhabitants of distant counties how they should want to travel. 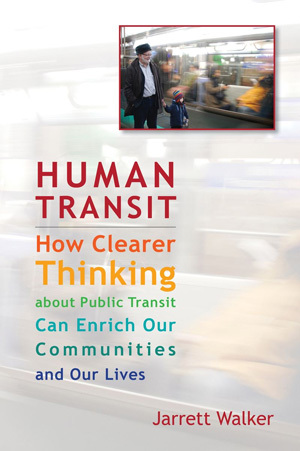 I agree, bikes & bike infrastructure can transform the transportation options for any neighbourhood; however, this book is about city neighbourhoods whose inhabitants often have very low incomes and not a lot of space. The calculus of buying a bike is similar to that of buying a car for someone who has just moved to the city in the developed world in terms of investment of capital and space to store it. Would you spend a couple thousand dollars up front on a bike when bus are is say, $2? Some might, but it’s not an obvious, widespread, solution. I write this is as somebody who bikes everywhere for personal transport; I am keenly aware of the importance of frequent, reliable transit though. I agree with Marta: bikes and transit can be natural allies and the question should seldom be framed as bikes vs transit.